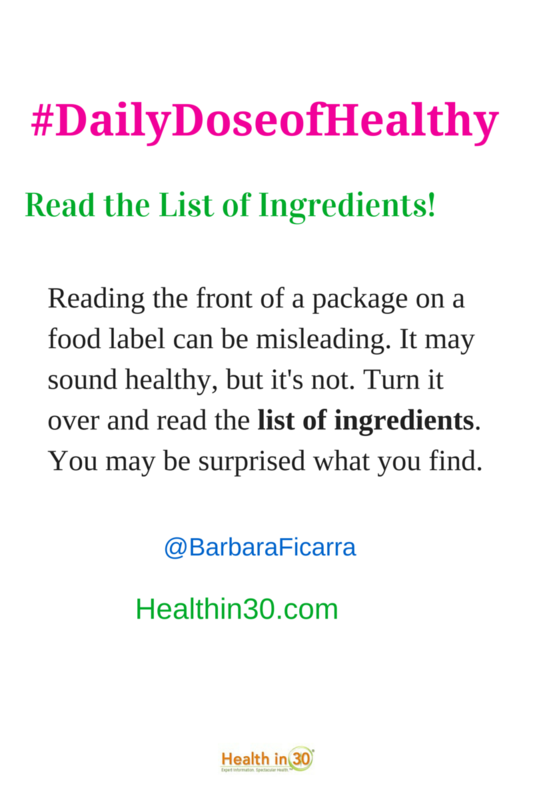 Reading the list of ingredients is more important than reading the front of the food label. The description on the front of a food label may be quite different than the actual ingredients. A food label may look “healthy” because the packaging and the wording are precisely created to capture your attention. You’re walking through the bread aisle and you see wording on a label, that says “heart healthy,” “winner best food award” given by a popular magazine, “100% whole wheat,” “40% fiber in 2 slices,” and “22 grams of whole grains per slice.” You purchase it and why not? It seems healthy, but is it? Turn to the back and read the list of ingredients. The first 2 ingredients are fine, “whole wheat flour” and “water,” but the next ingredient isn’t so healthy; “high fructose corn syrup.” Now, would you buy it? So remember, make sure the next time you’re food shopping, read the list of ingredients, not just the front of the label. You may be surprised at what you find. Healthy nutrition is vital. Remember, prevention, it begins with you. There are a LOT of other misleading words and ingredients on food labels than just this. As a health coach and someone who has maintained a 125+ pound weight loss over the last 6 years, I also recognize and teach my clients and readers about the dangers of food labels that claim to be “natural”, for instance. Because natural can mean anything. These are also at least 50 different words for “sugar” and maybe 15 for MSG. And not all oils are created equal. You almost need a nutrition degree to be 85% sure you’re eating healthy if you’re eating processed foods. See a new and improved Health in 30! Get Health in 30® via RSS or Email to receive site updates. Barbara Ficarra, RN, BSN, MPA, is an award-winning broadcast journalist, health educator, HEALTH DESIGNER™, health/lifestyle expert, international speaker, writer, consultant, and on-air expert. Barbara is a featured writer on Huffingtonpost. She is founder of BarbaraFicarra.com, a lifestyle destination site. She is a registered nurse active on the front lines of health care, and she is an administrative supervisor at a level 2 trauma center and covers multiple medical and surgical units, critical care, oncology, cardiology and step-down units, the psychiatric in-patient unit, the women's and children's units, and the emergency department. Her clinical experience ranges from oncology to general medicine and surgery. Barbara is a leading voice in health and she focuses on consumer and patient engagement and empowerment, health care social media, healthy living, and health care technology-telemedicine, telehealth, mHealth, and gamification. Barbara offers practical advice for consumers by focusing on health and wellness. Her trademark is simple and useful information from a trustworthy source to help people to take charge of their health. Read more about Barbara. Get the latest health news and tips delivered straight to your inbox. Health care isn’t just what happens between you and your medical professionals. It’s about taking care of yourself, in and out of the doctor's office, and it's about maintaining your well-being and achieving spectacular health. In her blogs, Barbara shares a nurse's inside perspective on healthy living and personal health, as well as the latest legal and political health care issues making all the headlines. Barbara sorts through latest research and provides you with relevant information without any of the confusing medical jargon. Barbara is dedicated to delivering you accurate, balanced, reliable and trustworthy health and medical information. She'll help guide you so you can make informed decisions about your health. Take charge of your health and enjoy every day! Learn about writing guest blog entries, being an expert guest on the Health in 30 radio show, and sponsorship and advertising opportunities. The Treatment Advocacy Center is a national nonprofit organization dedicated to eliminating barriers to the timely and effective treatment of severe mental illnesses. The center promotes laws, policies, and practices for the delivery of psychiatric care and supports the development of innovative treatments for and research into illnesses such as schizophrenia and bipolar disorder. Award-winning actor and activist Martin Sheen is working to raise awareness of the need improve treatment for severe mental illnesses. To learn more, watch a recent television interview in which Sheen discusses the challenges and struggles facing those living with these diseases. The Health Care Blog (THCB) shares insights about the health care system from leaders in the field. It has a reputation as one of the most respected independent voices in the industry. The Wall Street Journal calls it "among the most widely read insider publications in the field." WebMD describes it as "a free-wheeling discussion of the latest healthcare developments." As discussed with Barbara Ficarra, expert contributor to REAL SIMPLE magazine! You can download your own Personal Medical History & Medication Form and print it out to keep in your wallet. Copyright © 2019 Health in 30. All rights reserved.